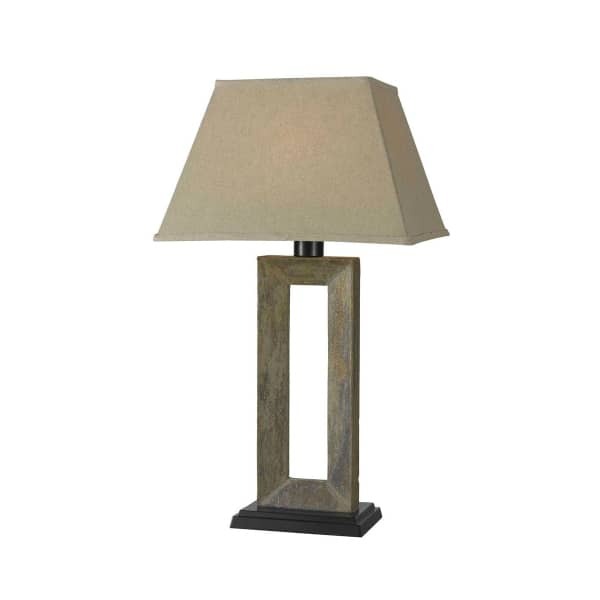 The Egress Outdoor Table Lamp features a natural slate finished base capped with a tan tapered rectangular shade. The squared base draws the eye through the rectangular space. Geometric, squared edges abound on the Egress Outdoor Table Lamp. It’s meant to sit tall on a surface of your choosing, whether the end of an outdoor dining table or the center of a side table incorporated into a deep seating collection. Outdoor lighting gives a necessary added functionality to outdoor spaces, allowing you to sit outdoors well beyond sunset, or for task activities like crafting and reading. The Egress Outdoor Lamp is rustic in nature and suits styles ranging from a dramatic, contemporary setting because of its sharp edges, or an old-fashioned log cabin setting because of its natural slate and tan color combination. This isn’t your average outdoor lamp, but your outdoor space isn’t an average space, is it?